If we follow the structural sequence of living organisms, we will find that the cells of any living organism are made up of organic and inorganic molecules, and each of these molecules is made up of atoms. Inorganic molecules in living organisms, such as water and salts, often do not contain carbon atoms. Organic molecules, such as carbohydrates, lipids, proteins and nucleic acids, are large molecules containing carbon and hydrogen and are called biological macromolecules. 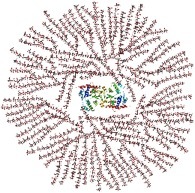 Biological macromolecules are large-sized organic compounds made up of smaller molecules. All these compounds contain the carbon element and they are vital for the life of living organisms. Most biological macromolecules are called polymers. Polymers are made up of a combination of smaller molecules called monomers, through a process called polymerization. Carbohydrates are biological macromolecules made up of smaller molecules called monomers. Carbohydrates include sugars, starches, and fibers. They are symbolized by the formula (CH2O)n. According to this formula, carbohydrates are made up of carbon (C), hydrogen (H) and oxygen (O) atoms in the ratio 1:2:1. The chemical composition of simple sugars is made up of either one sugar molecule (monosaccharide), or two molecules of monosaccharides linked together to form a molecule of disaccharides. 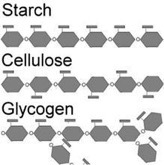 Complex sugars are polysaccharides made up of monosaccharides such as starch, cellulose, and glycogen. Each of them is made up of glucose molecules combined together. Complex sugars are insoluble in water, have high molecular weight, and do not have a sweet taste. 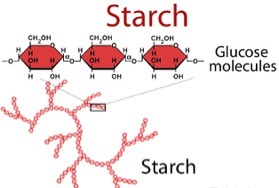 Starch, or amylum, is a polymeric carbohydrate consisting of a large number of glucose units joined by glycosidic bonds. This polysaccharide is produced by most green plants as an energy store. It is the most common carbohydrate in human diets and is contained in large amounts in staple foods such as potatoes, wheat, maize (corn), rice, and cassava. Pure starch is a white, tasteless and odorless powder that is insoluble in cold water or alcohol. It consists of two types of molecules: the linear and helical amylose and the branched amylopectin. Depending on the plant, starch generally contains 20 to 25% amylose and 75 to 80% amylopectin by weight. Glycogen, the glucose store of animals, is a more branched version of amylopectin. In industry, starch is converted into sugars, for example by malting and fermenting to produce ethanol in the manufacture of beer, whisky and biofuel. It is also processed to produce many of the sugars used in processed foods. Dissolving starch in warm water produces a wheat paste, which can be used as a thickening, stiffening or gluing agent. The biggest, industrial, non-food use of starch is as an adhesive in the papermaking process. Starch can also be applied to parts of some garments before ironing, to stiffen them. Cellulose is an organic compound with the formula (C6H10O5)n. It is a polysaccharide consisting of a linear chain of several hundred to many thousands of β(1→4) linked D-glucose units. 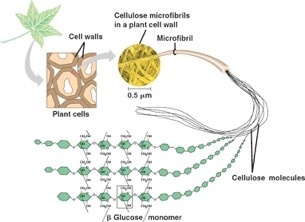 Cellulose is an important structural component of the primary cell wall of green plants, many forms of algae and oomycetes. Some species of bacteria secrete it to form biofilms. Cellulose is the most abundant organic polymer on Earth. The cellulose content of cotton fiber is 90%, wood is 40–50% and dried hemp is approximately 57%. Cellulose is mainly used to produce paperboard and paper. Smaller quantities are converted into a wide variety of derivative products, such as cellophane and rayon. The conversion of cellulose from crops into biofuels, such as cellulosic ethanol, is under investigation as an alternative fuel source. Cellulose for industrial use is mainly obtained from wood pulp and cotton. Some animals, particularly ruminants and termites, can digest cellulose with the help of symbiotic micro-organisms that live in their guts, such as Trichonympha. In humans, cellulose acts as a hydrophilic bulking agent for feces and is often referred to as a ‘dietary fiber’. Glycogen is a multi-branched polysaccharide of glucose that serves as a form of energy storage in animals and fungi. The polysaccharide structure represents the main storage form of glucose in the body. In humans, glycogen is made and stored primarily in the cells of the liver and the muscles, hydrated with three or four parts of water. Glycogen functions as the secondary long-term energy store (the primary energy store is fats held in adipose tissue). Muscle glycogen is converted into glucose by muscle cells, and liver glycogen converts to glucose for use throughout the body, including the central nervous system. Glycogen is the analogue of starch, a glucose polymer that functions as energy storage in plants. It has a structure similar to amylopectin (a component of starch) but is more extensively branched and compact than starch. Both are white powders in their dry state. Glycogen is found in the form of granules in the cytosol/cytoplasm in many cell types and plays an important role in the glucose cycle. Glycogen forms an energy reserve that can be quickly mobilized to meet a sudden need for glucose, but one that is less compact than the energy reserves of triglycerides (lipids). In the liver, glycogen can make up 5–6% of the organ’s fresh weight (100-120g in an adult). Only the glycogen stored in the liver can be made accessible to other organs. In the muscles, glycogen is found in a low concentration (1-2% of the muscle mass). The amount of glycogen stored in the body – especially within the muscles, liver, and red blood cells – mostly depends on physical training, basal metabolic rate, and eating habits. Small amounts of glycogen are found in the kidneys, and even smaller amounts are found in certain glial cells in the brain and white blood cells. The uterus also stores glycogen during pregnancy to nourish the embryo.